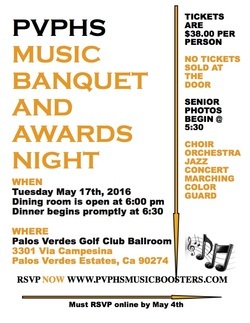 Check with your music group's booster leadership if you are not sure of your booster status. Purchase Tickets Below. No Tickets sold at the Door. A special thanks to all Music Booster Members for their financial support, time, and energy given to support the Peninsula High School Music Department. It’s been a great year with high accolades for each group, and with our kids impressing judges all over Southern California. None of this would have been possible without your help!